Sharp wins NHL All-Star Game MVP playing for losing team. 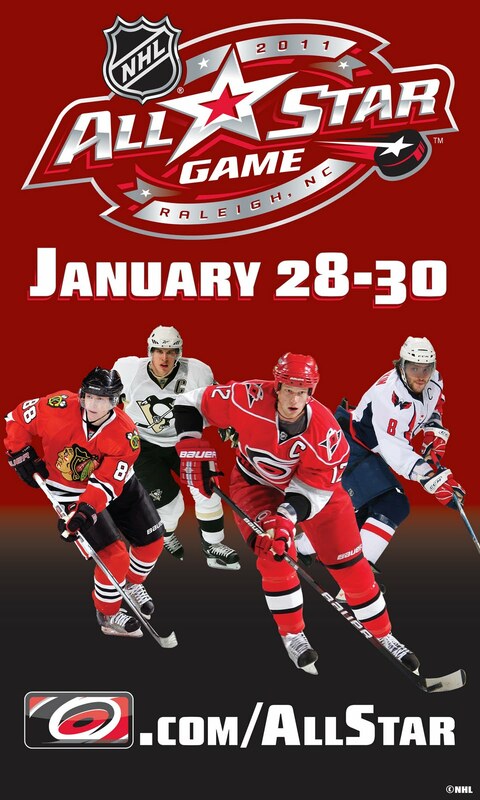 RALEIGH—The Blackhawks were heard from in this NHL Stt-Star Game with Patrick Sharp being named MVP for the losing Team Staal, the first Hawk so honored since Eric Daze.Nicklas Lidstrom limited his All-Star losses to a flip of the puck and the skills competition.The game was all his.Unfazed by having to pick second in the inaugural NHL All-Star fantasy draft, the Detroit Red Wings’ defenseman built and went on to lead another winning team — though this was the first one named after him.The four-time Stanley Cup champion and six-time winner of the Norris Trophy, given to the league’s top defenseman, was a plus-7 as he captained Team Lidstrom to an 11-10 victory over Team Staal in the All-Star game on Sunday night.Eric Staal had the No. 1 pick in the fantasy draft on Friday, the unconditional support of his hometown Carolina Hurricanes fans behind him, and a four-goal lead in the first period.Still, it wasn’t enough to beat one of the NHL’s greatest winners.Danny Briere, Jonathan Toews, and Martin St. Louis scored during a four-minute span of the third period to lift Team Lidstrom.Another Team Lidstrom defenseman, Shea Weber of Nashville, had four assists and was plus-6, and Dallas forward Loui Eriksson had two goals and two assists. Boston’s Tim Thomas stopped 11-of-15 shots in the third period and became the first goalie to earn the win in three consecutive All-Star games.Maybe Staal’s pick of Hurricanes goalie Cam Ward with the No. 1 selection in the fantasy draft wasn’t such a good idea, after all. Tampa Bay’s Steven Stamkos, the league leader with 38 goals, scored the one that made it 6-6 in the second.Ward could hardly be blamed for the four goals he gave up in the first. Pittsburgh’s Marc-Andre Fleury also allowed four in the opening 20 minutes of a typically defenseless All-Star game. The 21 total goals tied for fourth most in All-Star history.One consolation for the Team Staal: Sharp claimed MVP honors in a losing cause after he posted a goal and two assists.With the team in white named after Staal, the Carolina fans decked out in red hardly seemed to care that Sidney Crosby and his Pittsburgh Penguins teammate Evgeni Malkin were missing because of injuries.Staal’s club had a 4-0 lead, that was gone before the first intermission, and an 8-7 edge after Kris Letang’s second goal early in the third.Then Lidstrom’s club staged its second comeback and grabbed a late lead – only to have Team Staal attempt a rally.After Rick Nash cut it to 10-9 with 4:49 remaining, Eriksson sealed it by scoring into an empty net at 18:49. That insurance was necessary because Staal gave the RBC Center one more reason to yell when he made it 11-10 with his fourth career All-Star goal with 34 seconds remaining. Philadelphia’s Briere got one of the injury replacement spots and made the most of it. Briere gave Team Lidstrom a 7-6 lead with 4:29 left in the second and tied it 8-8 at 9:57 into the final period with his third career All-Star goal.That brought a smile to Peter Laviolette, a co-coach of Team Lidstrom who now runs the Philadelphia Flyers. Laviolette coached the Hurricanes to the 2006 Stanley Cup title. Local fans remembered him and that special season well Sunday and greeted his introduction with a huge ovation.Briere gave Team Lidstrom its first lead, not only of the game but of the entire weekend when he took a pass in the left circle and lifted a shot over Montreal’s Carey Price in the second. Team Lidstrom was beaten 33-22 in wire-to-wire fashion in the skills competition.Early in the second it appeared that Anaheim’s Jonas Hiller was in for the same anguish as the other goalies. Sharp, who had two assists in the first period, finished things himself 1:18 in when he took a pass from Philadelphia’s Claude Giroux in the left circle and snapped in a shot.Letang pushed Team Staal’s lead to 6-4 at 6:10 by ripping a shot off the post and in. That would be the final blemish on Hiller’s ultimately impressive performance.Hiller made acrobatic moves in the final five minutes of the second to deny 18-year-old Hurricanes forward Jeff Skinner and Columbus’ Nash. Hiller made his MVP pitch by finishing with 15 saves on 17 shots.Staal and Skinner, the NHL’s youngest All-Star ever, were often fed the puck by teammates trying to get them a goal — or two — as fans alternately chanted their names. NOTES—In addition to Sharp, Toews had a goal and 2 assists,Patrick Kane and Duncan Keith each had an assist which came on a goal by former Hawk Dustin Byfuglien,and ex Hawk Marty Havlat had three assists….Six sets of All-Star teammates wore identical numbers, including the goalie tandem of Ward and Lundqvist, who both donned their familiar No. 30. HONOLULU—MVP DeAngelo Hall had one of his team’s five interceptions and returned a fumble 34 yards for a touchdown to help the NFC match a Pro Bowl scoring record in a 55-41 victory over turnover-prone AFC in a game that was not nearly as interesting as the final would indicate.AFC quarterbacks Philip Rivers, Peyton Manning and Matt Cassel each threw first-half interceptions to help the NFC blow open a 42-0 lead in a performance ugly even by the historically low standards of this game.Fittingly for this strange contest, center Alex Mack of Cleveland scored the final touchdown on a 67-yard pass play that featured two laterals with 16 seconds left.Carolina’s Jon Beason returned the fifth interception thrown by the AFC, and second by Matt Cassel, 59 yards for the NFC’s final touchdown to match the single-team scoring record set in the NFC’s 55-52 victory in 2004. The Bears Devin Hester returned five kickoffs with his longest being for 30 yards and he caught two passes for a total of 27 yards.Julius Peppers played long enough to make two tackles. EVANSTON—No one could have blamed Thad Matta for letting out a sigh of relief. Top-ranked Ohio State’s coach expected a difficult time against Northwestern, and that’s exactly what the unbeaten Buckeyes got Saturday night.They also found a way to capture their 22nd straight victory, thanks to a late steal from veteran David Lighty and a tie-breaking free throw from freshman star Jared Sullinger to pull out a 58-57 victory over the short-handed and determined Wildcats.Once again it was Sullinger coming through for the Buckeyes. Northwestern had a chance to take the lead, but Lighty stole a pass near the basket with 17 seconds to go. And the Buckeyes then worked the ball into the 6-foot-9, 280-pound Sullinger.He was double-teamed throughout the game and in this instance, once he got the ball to go up near the basket, he was fouled. With Northwestern’s student section trying to distract him with waves and screams, he hit the rim with his first attempt and swished the second.After three timeouts, NU got a long attempt from Drew Crawford that hit the backboard.Sullinger finished with 21 points and Aaron Craft had 13 points for Ohio State. Leading by only two at the half, Ohio State (22-0, 9-0 Big Ten) pulled out to a 13-point lead in the second half with a 14-4 run. But Northwestern, playing without leading scorer John Shurna because of a concussion, came back behind senior guard Michael Thompson, who led the Wildcats with 16 points — 13 in the second half.Thompson’s 3-pointer with 3:51 left capped a 21-7 run as the Wildcats took a 55-54 lead and the crowd at Welsh-Ryan Arena erupted.Ohio State’s Jon Diebler — No. 5 all-time in the Big Ten in 3-pointers made — hit one for his first basket of the game to put the Buckeyes right back in front 57-55.Thompson then sailed through the lane and the 5-foot-10 guard floated the ball into the basket for a tie with 1:31 left.After an Ohio State turnover and then a foul, Northwestern retained possession and tried to set up a go-ahead shot. But Lighty foiled it.Northwestern (13-8, 3-7) fell to 0-16 all-time against top-ranked teams.Thompson’s 3-pointer with 7:53 left cut the lead to nine, and Ohio State’s Dallas Lauderdale was called for an intentional foul on the play near the basket. Davide Curletti made 1 of 2 free throws and the Wildcats retained possession with JerShon Cobb hitting a 3-pointer. The seven-point possession made it 51-46 with just a little more than seven minutes remaining.It was a sequence that got Northwestern back in the game. The Wildcats were successful most of the night with their deliberate pass-and-cut offense that would often take the shot clock down to the final seconds.Northwestern won the boards, despite the absence of the 6-8 Shurna, 31-20 and had 14 on the offensive end. Ohio State shot 57 percent for the game and Sullinger was 7 for 12 from the field.Shurna, who averages 19 points, sat on the bench in warmups with a boot on his left ankle that had been sprained earlier this season.The Buckeyes, meanwhile, have now matched the second longest winning streak in school history.In 2006-07 Ohio State also won 22 straight, counting tournament games, before losing in the NCAA championship game. The 1961-62 team was victorious in its first 22 games. The longest Buckeyes win streak was 32, spanning two seasons from 1959-60 (last five) to 1960-61 (first 27). NOTES—Pacers F Tyler Hansbrough missed his second straight game because of pneumonia. “We thought we’d have him today because we shot him up with antibiotics yesterday,” O’Brien said. “He can’t go. He wants to go. He wanted to go last night. But our medical staff is not permitting him to play.” ……In a nod to Rose saying spicy food caused his ulcers, O’Brien said in jest when asked how to contain the guard: “You’ve got to offer him some spicy Nachos before the game.”…..McRoberts’ previous high was 18 points against Houston on April 4. Derrick Rose scored 22 points despite two stomach ulcers, Luol Deng added 26, and the Bulls beat Dwight Howard and the Orlando Magic 99-90 on Friday night.So are the Bulls, who won for the ninth time in 11 games even though Howard scored a season-high 40 points. They took the lead with a big third quarter and then held off a late push by Orlando.The Magic cut it to 93-90 after Howard scored, stole a pass and fed Gilbert Arenas for a layup. Deng then scored down low with 1:22 left, and Rose hit four free throws the rest of the way, sealing the win.Deng had 14 in the third as the Bulls doubled up the Magic 34-17, turning a five-point halftime deficit into an 80-68 lead.Carlos Boozer added 16 points and 16 rebounds, helping the Bulls avenge an earlier blowout at home by Orlando.It was a rough night for the Magic even though Howard was at his best.He was five shy of his career scoring high while pulling down 15 rebounds, but Orlando simply came up short against the Central Division leaders. It hit just 5-of-21 3-pointers with the Bulls fixated on defending the perimeter, even if that meant letting Howard go wild, and got outrebounded 54-40. Howard had some fun at his point guard’s expense, calling him Jameer Cutler after the game. He wasn’t so amused by the effort on defense, particularly when the Bulls hit 13-of-21 shots in the third.Rose was off target, hitting just 6-of-21 shots. Even so, he finished with 12 assists as the Bulls beat the Magic for just the seventh time in 20 games.Even with their star ailing, the Bulls got some measure of revenge for what Orlando did to them the last time they visited the United Center. It wasn’t quite as lopsided as that 107-78 pounding in December. NOTES—Orlando’s Stan Van Gundy likes what he’s seeing from the Bulls in their first year under Thibodeau. “I think that there’s a handful of guys — probably three or four — that at the halfway point would have to be considered Coach of the Year,” Van Gundy said. “And he’d have to be right up there with anybody.”……Saturday’s game against Indiana will be the 12th in 21 days for the Bulls. 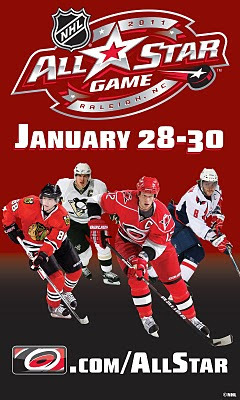 The following are rosters for the NHL All-Star Game, representing Team Staal and Team Lidstrom, to be held Jan. 30, 2011 at the RBC Center in Raleigh, N.C.
Derrick Rose will be starting in the NBA All-Star game in Los Angeles. Last year he became the first member of the Bulls to PLAY in the All-Star contest since Michael Jordan in 1998, and now he becomes the first Bull to START since that same game at Madison Square Garden in ’98 when MJ was the game’s MVP. Did the fans get it right? Yes. Rajon Rondo was really the only other candidate and Rose only recently took him over for the starting spot. But with the numbers Rose has put up plus the with just how exciting he is, he’s the correct choice. Rondo would’ve been a fine pick, but Rose is emerging as an MVP candidate and is the only player in the league averaging 24 points and eight assists a game. Rose is the game’s youngest starter by a few days over Kevin Durant. Did the fans get it right? Yes. Wade is one of those guys that really will be a starter for life. Some worried when he teamed up with LeBron that his numbers might dip. They haven’t. Wade’s still awesome. So again, a good pick by the fans. Did the fans get it right? Yes. Let me tell you, these Eastern voters are smart people. But then again, it’s not hard to be when all the top players are also the biggest fan favorites. It helps in the East that there really wasn’t an alternative either though. LeBron hasn’t suffered any kind of drop-off in popularity or production, pulling in a huge number of votes while also making yet another All-Star team as a starter. Did the fans get it right? Yes. Stoudemire becomes the first Knick starter since 1997 when Patrick Ewing was named to the team. This is really the most debatable position in the Eastern Conference. Kevin Garnett was on top for a good part of the year but Amar’e overtook him in January. Tough call really and neither guy is a bad pick. But Stoudemire has helped restore basketball in New York has put up huge numbers and is establishing himself as an MVP candidate. Garnett, while excellent, was injured for a few weeks and doesn’t have the same numbers as Stoudemire. Did the fans get it right? Yes. When your other options are Shaquille O’Neal an injured Andrew Bogut and I don’t know Nazr Mohammed (seriously, who else is there?) Howard is a pretty easy pick. He’s got this spot locked up for a while and as his total votes showed, he’s one the league’s biggest names around the world. Did the fans get it right? Yes. This was a close one. The Western guards is the deepest position in the league. Deron Williams, Russell Westbrook, Tony Parker, Steve Nash, Monta Ellis and on and on. But Paul has been good all season and across the board in statistical categories, Paul is at the top or very near it. Did the fans get it right? Yes. Kobe led the way in votes again and anchors the West squad. There’s no question that as long as he’s still bouncing a ball that he’s earned a spot in this game. And with the biggest name across the world in terms of basketball, he’ll have a starting spot for a long time too. Did the fans get it right? Yes. The league’s leading scorer and the youngest starter for the West. At just 22, Durant is probably just now starting a very, very long run as an All-Star starter. A lot of people wondered that if in small-town Oklahoma City that he’d gain the national recognition needed to become a big-name star, but evidently that wasn’t a problem. Durant was the second-leading vote-getter in the West behind Kobe. Did the fans get it right? No. A tough call but first of all, Melo isn’t really a power forward. And since Durant beat him out in the forward vote, Carmelo is the one that’s cut. No doubt Melo is having a nice season, but with Blake Griffin, LaMarcus Aldridge, Pau Gasol and Kevin Love playing the ACTUAL position, it’s hard to justify Melo being a starter. One of those guys is more deserving of this spot based on what they’ve done this year. Did the fans get it right? Um, no. Yao has only played in five games and trust me, he wasn’t that amazing in those five games. Yao is the poster child for what’s wrong with fan voting. Other than Yao, you can really make the case that the other nine starters are justified. But because of China, Yao is voted in again while other more deserving players sit behind him. The commissioner will fill this spot and it’ll likely be with the runner-up Andrew Bynum, a pick that’s still not that good. BLOOMINGTON, Ind—Jordan Hulls scored 12 of his 18 points in the second half, and Tom Pritchard’s tip-in with 44.2 seconds left led the Indiana past No. 20 Illinois 52-49, setting off one of Bloomington’s wildest postgame parties in years.Hulls, who was sick Sunday at Iowa, started the game with a wrap on his right knee and finished it with a bandage on his right temple, tape around his right forearm and blood on his shorts.Pritchard, who drew four fouls in the first nine minutes of the second half, came up with the game’s biggest play when he got his fingertips on a missed shot and redirected it in for the go-ahead basket, just his second all night. Indiana’s Christian Watford, who had 16 points, had blood on his jersey.But none of that mattered to Hulls, who scored more than half of Indiana’s 22 second-half points while three of the Hoosiers’ projected opening-day starters — guards Maurice Creek and Verdell Jones and center Guy-Marc Michel sat on the bench in street clothes. Creek and Jones were out with knee injuries. Michel was declared ineligible by the NCAA in December.After ending a 19-game losing streak against Top 25 teams, Crean traded high-fives with fans who stormed the court. Students jumped up and down at midcourt as Hulls tried to finish a television interview, and some of the Hoosiers got in on the act, too, before heading to the safety of their locker room where the celebration continued.The last time Indiana (11-10, 2-6 Big Ten) had beaten a ranked foe: Feb. 19, 2008 against Purdue.Mike Davis led the Fighting Illini (14-7, 4-4) with 14 points, but nobody else reached double figures. Demetri McCamey finished with six points, his second straight game with fewer than 10, and Illinois’ vaunted 3-point shooters were a dismal 5 of 20.Illinois has lost four of its last five. TAMPA—Hugh Robertson scored 16 points as South Florida beat DePaul 71-60 on Thursday night, extending the Blue Demons’ losing skid to 21 straight games against Big East opponents.Jawanza Poland and Toarlyn Fitzpatrick added 11 points each for South Florida (8-14, 2-7). The Bulls’ other Big East win this season came on Jan. 16, a 79-72 victory over Providence.DePaul (6-14, 0-8) got 17 points from freshman Cleveland Melvin. Its current Big East losing streak includes 20 regular-season games and one at the conference tournament.The Blue Demons have not won a Big East game since a 51-50 victory over Marquette on Jan. 20, 2010. DePaul is the lone Big East team without a conference win this season.After DePaul center Krys Faber scored four consecutive points, South Florida responded with a 10-0 run – including two slams by Poland and Augustus Gilchrist’s 3-point play – to go up 63-48 with 4 minutes left.Faber finished with 16 points. DePaul got within 66-60 on a late run that included a long-range jumper by Moses Morgan and Melvin’s basket during a 5-on-none break.Hugh Robertson hit a 3 and Anthony Crater added two free throws in the final minute that made it 71-60.South Florida took a 35-25 halftime lead, thanks in part to a 13-3 run in the final 5 minutes. Fitzpatrick hit a 3 and the Bulls made all six free-throw attempts during that stretch.USF went 12 for 12 from the line in the opening half, while DePaul converted four of its five chances. The Bulls also outscored DePaul 16-0 off the bench in the first half and 26-9 for the game. Geoff McCammon scored 27 points to lead Loyola to an 84-71 victory over Youngstown State Thursday night.Ben Averkamp had 19 points and 12 rebounds for the Ramblers (13-8, 4-6 Horizon), who have won three in a row. McCammon’s 3-pointer with 16:09 remaining put Loyola ahead to stay 43-40 and the Ramblers eventually opened up a 16-point lead.Terrance Hill added 19 points and Andy Polka scored 12 points for Loyola, which went 19 for 20 at the free-throw line. Kendrick Perry led Youngstown State (7-13, 1-9) with 21 points. Tre Brewer, a reserve, scored 17 points in 21 minutes for the Penguins, who fell to 0-9 on the road. It was the 2,000th game for Youngstown State’s men’s basketball program; the Penguins have won 990 of them.